The drive toward automation is everywhere. This seismic shift is enabled both by new technologies and older ones whose time seems finally to have come, such as machine learning, artificial intelligence and cloud computing. Underpinning the onward march of automation is a very basic issue: the quality of the data that is used. In partnership with A-Team Group, Thomson Reuters commissioned a survey with trading technology and data professionals at Tier 1 and Tier 2 financial institutions globally to understand the current state of play, key challenges and future outlook. This report discusses these issues plus common points of failure, and suggests approaches for sourcing consistent data to ensure automation goals are met, including the possibilities of new cloud computing options. 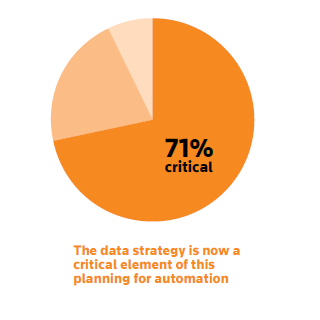 Automation is on the rise – 54% of respondents were 50% automated or more. Just 23% were 25% or less automated. Thomson Reuters Elektron Data Platform integrates and delivers all the content and capabilities you need. Better content, smarter analytics and controlled distribution – the three elements that together deliver the unique insights they need to make smarter trading and investment decisions – ahead of your competitors. Explore the resources to learn more.